Born in Dublin in 1952, Judith Appleby qualified as an architect and spent most of her career teaching architecture. Her Masters degree developed new ways of teaching creativity. She has a PhD from Nottingham University. 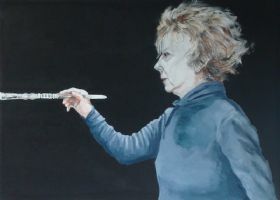 Judy took up full time painting in 2006 and as a self-taught artist has applied herself intensively to studying the work of other artists and discovering her own concepts for painting. Judy�s work demonstrates a distinctive style and she is emerging as a significant local artist. 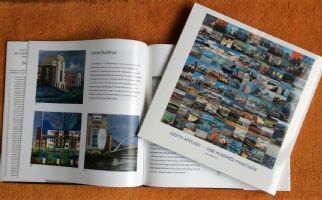 Individual paintings have been shown in various locations around the North East and have attracted enthusiastic interest. Her first solo show was at The Sage, Gateshead in October 2010 and she is currently contracted with The Biscuit Factory, UK's largest and probably its most striking commercial art space. The Old School Gallery in Alnmouth also shows a good range of Judy's work but particularly her paintings of the Farne Islands and North Northumberland. Judy lives with her husband Ian in Gosforth and in Falstone, Northumberland, and has a painting studio at The Biscuit Tin in Newcastle. "The historic landscape of Northumberland is a constant source of inspiration. I have been developing an approach that exaggerates the natural geometries of rocks and skies, and then overlays these with stylised interpretations of powerful structures. The effects have suggestions of cubism and some abstracted images are reminiscent of the elegance of Art Deco. It is a demanding technique and progress is slow as individual shapes must be masked for painting. In contrast to this I also work with a more expressive broad brush approach, but still emphasising the patterns and geometries of natural and man-made structures in the landscape." "Winters in tropical India provide a dramatic contrast with the subdued light of North East England. Reds and rich earth tones become dominant, they vibrate against the dark greens of tropical foliage, and the midday heat makes the colours and outlines of buildings shimmer. The streets are usually bustling with people, traffic and animals. Everyone is pressed closely together, especially on the ferries or the buses. The temples often provide a welcome tranquil oasis. I have tried to capture the intensity of colour and light and the complexity of everyday scenes." "Northumbrian Landscapes 2011-2014" is available as a signed, numbered copy from a limited edition of 40. 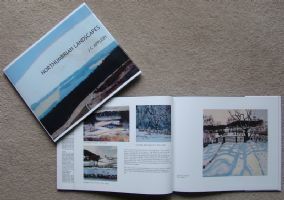 Both books are large format 30cmsx30cms with all colour illustrations.